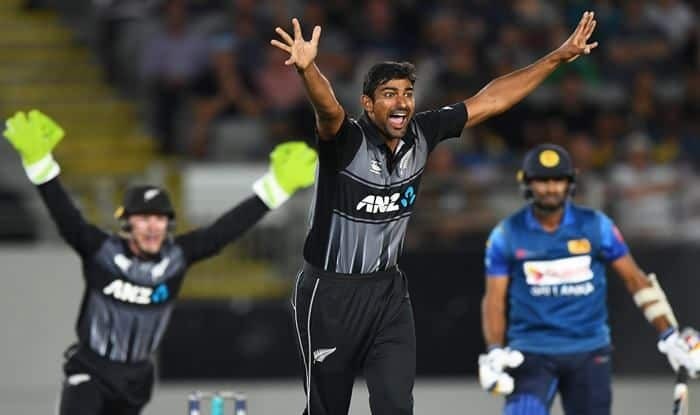 New Zealand defeated Sri Lanka by 35 runs in their one-off T20 international at the Eden Park on Friday. Chasing a huge total of 179, Sri Lanka got off to a bad start with Sadeera Samarawickrama getting out on the first ball. New Zealand defeated Sri Lanka by 35 runs in their one-off T20 international at the Eden Park on Friday. Chasing a huge total of 179, Sri Lanka got off to a bad start with Sadeera Samarawickrama getting out on the first ball. Stabilizing the Sri Lankan innings after the initial jolt, all-rounder Thisara Perera played a gutsy knock of 43 runs which included two boundaries and three sixes. His efforts, however, went in vain as no other batsmen stood up to the occasion. For New Zealand, Paceman Lockie Ferguson and spinner Ish Sodhi scalped three wickets each helping their side bowl out the visitors at a score of 144 runs. Earlier, riding on the back of Bracewell’s smashing innings of 44 runs, New Zealand put up a solid total of 179 runs. Another notable performance came from debutant Scott Kuggeleijn, who played an unbeaten knock of 35 runs off 15 balls. With a win over Sri Lanka, New Zealand clean sweeps the visitors across all formats in the tour. Previously, they had defeated Sri Lanka 1-0 in a two-match test series along with a dominating 3-0 win in three one-day internationals that the two nations played.